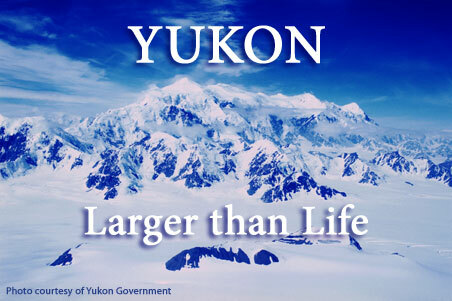 BBCanada.com - The Yukon, larger than life. The one thing we can absolutely guarantee, year after year, is snow. Snow that covers the boreal forest, snow that coats the peaks in white, snow that melts beneath the ski, or flies from the snowmobile track, or flutters from the paws of a dog team. Snow: we’ve got it. And we’re not talking about that on-again, off-again stuff that is ice one day and water the next. No, we’re talking snow, the real stuff with the infinite variety of flakes. 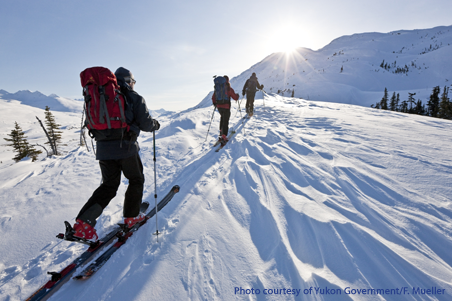 From November to April, snow turns Yukon into a winter playground. 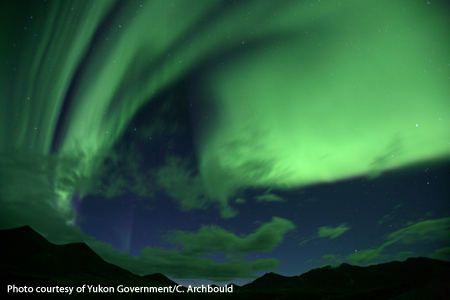 There is nothing quite like experiencing a Yukon winter. For some, it’s breathing in the white-clad beauty. Others hear the absolute silence. Some demand the physical challenges. Others exalt in the Northern Lights. But everyone wants the unforgettable memories. 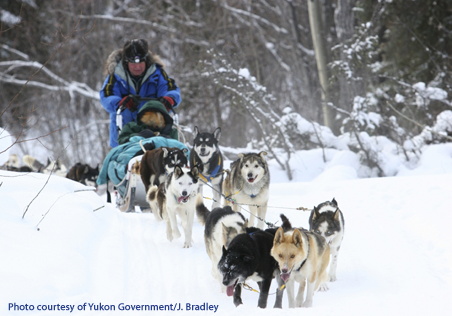 You can get all this and more when you’re mushing a team of dogs through Yukon wilderness. Whether it’s out on the trails near the edge of town or running through remote valleys and mountain passes, dog mushing puts you at one with nature: man and the elements; just you and your dogs. Adventure operators offer a variety of dog mushing tours, for the novices, for the adventuresome, for the experienced. Day trips are available from the edge of Whitehorse but so are prolonged over-land tours that will take you to places that will expand your sense of wonder. But, hey! Some people don’t want dog power, they want horse power and they get it on a snowmobile. Again, you can take to the wilderness from the edge of town or you can leave everyone behind and head into the back country to ride the valleys, the mountain sides, the forest trails and the frozen lakes and rivers. 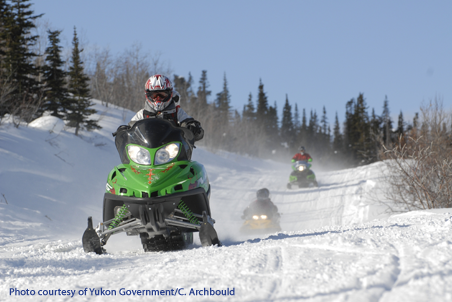 Snowmobiling is all play, whether following a forest trail or free-riding the lakes. You can go places on these motorized sleds that were unimaginable not long ago. In fact, you can ONLY get to some places on a snowmobile. But it isn’t all riding. When you’re out in this outback freedom you can build igloos, ice fish, snowshoe, ski if you want and at night you can celebrate the day under the mystical colours of the northern lights. The pre-eminent cross-country ski centre is Whitehorse where there are hundreds of kilometres of cross-country ski trails, ranging from the pastorally easy to the lung-busting hard. The trails at Mount McIntyre (which hosted a World Cup event) are painstakingly groomed and configured for skating as well as diagonal. And there is all that back country just begging to be explored. Our adventure companies will take you there and introduce you to the terrific variety of topographies and opportunities: skiing the valleys, telemarking the mountain sides, skijoring (being pulled by a dog in harness) the forest trails and even flying into one-of-a-kind places. But, hey, why would you come here just to ski, or just to snowshoe, or just to dog mush or just to snowmobile? Why wouldn’t you come up here and do them all? We have the snow, we have the landscape, we have the facilities, we have the gear and we have the adventure companies, so why not cram them all together in one long, unforgettable winter experience? The Aurora Borealis, an experience like no other. You can see a thousand pictures of the aurora borealis and still not be prepared for your first sight of the real thing – or your second, or your hundredth; the show is never the same twice. It may span from horizon to horizon in a great white arc, or a band of twisting colours, or it may burst out like colossal fireworks all over the sky. It may suddenly send down vertical rays of colour that reach out as if to touch your face, and then as suddenly fade to a pale and beautiful veil, like a distant cloud disintegrating into the heavens. It may shine a ghostly white with hints of colour around its feathered edges, or it may flash vivid greens, or even stain the whole sky a bright, burnished red. Visit from late August to mid-April, and plan to be outdoors between 10 p.m. and 2 a.m., and chances are you’ll be blessed with a sighting of the lights. To find out more about the wonderful experiences awaiting you in the Yukon, visit travelyukon.com or connect with us TravelYukon on Twitter. To make your stay truly unique, explore these charming and cozy accommodation choices, in Yukon B & B’s. 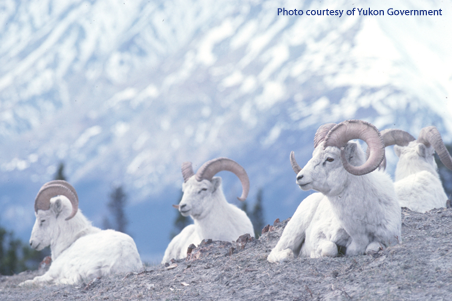 Wildlife abounds in the Yukon.